I was reading my blogroll yesterday and came across KC Dog's post on temperament testing at shelters. Please read it. This subject of temperament testing as a solidifying determinant of Good Dogginess has fascinated me. Mostly because my 10 year old pit bull, Mina, failed her temp test . I say this proudly because I think this so-called temp test is a lose-lose sham of an evaluation. I was a volunteer at the shelter where she was awaiting death. She was this somber little dog who I thought had given up on life. Every visit, she'd be curled up in the back of her kennel, looking forlorn. I like to think she was waiting to make sure I was a consistent visitor, that I would keep coming and not leave her. And after a week, she would wedge her short body between the Rottweiler and Lab who shared her space. As she was bashed back and forth, she'd just stare at me, deep, questing, looking. It was a gaze I could not ignore. So when she was attacked by one of her kennelmates, I asked a pit bull friendly officer to temp test her. It wasn't just the attack, it was the fact that 7 business days had passed, her chance at a spot in the adoption kennel was now. And so we went into the "temp testing" room. Which was also the room for incoming dogs. And cats. And sometimes farmed animals. It was small with only one dingy window. This is where dogs were vaccinated, microchipped, weighed, and it served as a meager evaluation room. It was next to the cat room and adjacent to the overwhelmingly sad "dangerous dog" kennel. Only the strongest of the strong could thrive in this room - most dogs felt uneasy and taken aback by its strange smells and sounds and sense of confinement. I was too. - Dog is touched all over. He is expected to tolerate his ears being tugged, his tail being yanked, the scruff of his neck being grabbed. She must endure hugging and must not withdraw her paws from being handled. He must not ever growl or give warning signals or shy away from touch. She must want to be with people, bask in their company. - Dog is "sound tested" for "recovery period". When a metal bowl is flung near him, he must recover within 1-3 seconds and approach the bowl. She must not run for cover. He must now growl or bark or exhibit any sign that says, holy crap! a fricking loud bowl nearly killed me! - Dog is "food tested". A bowl filled with canned food is placed in front of the dog. He must not hog the bowl, even if he has not eaten properly in weeks. She must not tense or growl or snap or nip or bite at the plastic hand. Ten minutes. That's it. That is all every dog at this shelter was given. And when I think about the joy and wonder Mina has brought to my life, I cannot help but shudder that this life, HER life was reduced to ten minutes. In Mina's case, the officer liked pit bulls, loved dogs. He spent an hour with her. She was (is) stoic and unsure of the world. It took 20 minutes for her to crawl into his lap, but once she did, she was his. She wanted nothing more than to be in his company. Everything about her said she was scared but, true to her inner-solidness, she wanted to be a part of the world and with the people in it. This officer did not bother with the sound test, it was silly. She wouldn't take food and her behavior indicated she probably wouldn't resource guard it, either - she either respected or feared people too much to think something could belong to her. There was so much more to her than we would see in this hour long evaluation, let alone a 10-minute one. After the evaluation, the officer looked at me and we talked about her options. This was a dog who would make a good pet, a great companion. He thought she'd be good with kids. Thing was she would not come close to ever thriving in a kennel. She was scared of the other dogs, frightened by the noise, petrified by the steel and cement enclosures. Even if he passed her - and he was willing to give it a go - I had the sickening realization she'd never get adopted at this shelter, that she'd shut down. And she is not alone. She is the face of dogs everywhere who are failed by a system that is supposed to save them. She was failed by her breeder who didn't care about health checks or breeding for sound structure. She was failed by her owner, who bred her at a year of age, abandoned her to the streets with a 4' long, 3" thick belt looped tightly around her neck. She was failed by the animal control officer she crawled up to. She was failed by the shelter who thought a 60% death rate and a 10-minute evaluation were stuff to be proud of. She was failed by our public officials who provide few resources to their government-run shelters. She was failed by a society that deemed pit bulls and dogs like her to be unworthy of a companion home. I don't write this to slam shelters or rescues who can't pull them all. I spent six years volunteering with shelters, three years intimitely with the county shelter where Mina came from. I know the challenges and the difficulties and the heartaches. But things have to change. Dogs like Mina should not be dying because of a test that, at its VERY core, sets the dog up for failure. Unfair does not even begin to describe it. We need to be creative with kennel enrichment. We need a large, vast pool of volunteers to keep these dogs active, their minds stimulated. We need kennels that cater to the needs of individual dogs. We need behavior evaluations performed by qualified trainers or behaviorists. We need tests done in a few different environments to guage where modifications need to be made. We need to realize these tests, except in the cases of extraordinarily off-the-richter-scale aggression or ill-health, are not pass/fail, not live/die scenarios. And these things can be done, they're being done in some shelters, including some awesome government run facilities. Our paradigm shift needs to include city and county shelters who desperately need the infrastructure, funds and resources to implement these types of programs. Because every day, dogs like the one you see below are being killed. And that is a travesty. Seriously. Travesty. I mean, really. 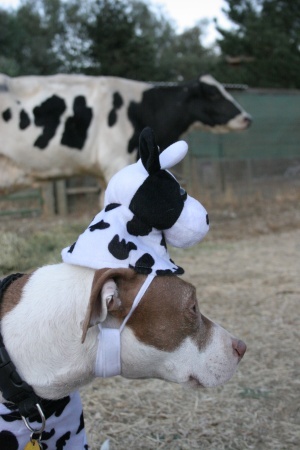 She's a dog dressed up like a cow NEXT to an actual cow. The world would be a much sadder place without a dog like this in it. What a sweet, sad, worn face. I'm so glad you and she found each other. What you say is 110% correct and it is heart breaking. Sometimes I just get overwhelmed b/c it's the PEOPLE who are over-breeding, abusing, selling, buying, abandoning and perpetuating the Hell on Earth for these "pit bulls." So until we fix the people, the dogs will never stop being our victims...when? Temperament tests were not designed to be a PASS/FAIL. They are supposed to be one (of many) tools used to determine what direction the dog needs to be pointed in for training and what type of home environment he'd do best in. I agree, temp tests shouldn't be the sole factor in life or death. Especially when so many dogs can't handle the shelter, or have been failed, as you nicely put it, by humans in the first place. It is nice that you live near an area that actually let you adopt a pit bull from a shelter- some areas in Ohio won't let you adopt one if they get it in. It really makes me sick, so yes, we need changes and we need more people like you! If the cow costume were part of a temperament test, surely Princess would fail while she was running around hugging every wall and object trying to 'scratch' it off of her. Thank you for sharing Mina's story and letting her enrich your life and continue to teach you lessons. Most dogs can bring so much to people if they let them and can find the right human. Thanks for being hers! Great story - and you are right we need better evaluations and more enrichment. My pitty-mix never would have passed that evaluation before foster care. And she is the perfect dog- loves kids, other dogs , and is petrified of cats. Thanks. I'm dismayed at how the temperament tests have become an absolute, pass/fail thing for so many shelters and rescue groups. I'm sorry, keeping these dogs costs money shelters simply don't have. The ASPCA and any respectable company follows these rules to find out which dogs are suitable and which aren't. If that dog turned around tomorrow and ripped out someone's flesh then the shelter who allowed a dog to be adopted out ( in spite of failing a few simple tests ) would have a suit against them in a matter of hours. What do you expect? That the dogs get hours of evaluation each? I don't think so. It doesn't take more than 10 minutes for you to know if someone is a good person or if you would want a particular person to hang around your kids or family. The same thing goes with animals. I know it sounds cruel but unless you're funneling out money to keep potentially aggressive dogs alive you have no right to complain about their methods of controlling over breeding and lack of sympathy on society's end. Anonymous, it is sad you feel that way, that you feel killing healthy, adoptable dogs is a better solution than fixing whatever minor problems they have. Most dogs don't bite. Most aren't aggressive. To argue that because a dog is shy or afraid of loud noises or guards their food they deserve death is incredibly unfortunate and is hardly fair to the millions of dogs in this country. The A does evaluations and uses those results to create a program for each dog. They don't do a 10-minute eval and then condemn a dog to death. Their evaluations are much longer and often include modification programs, when suitable. No, they aren't perfect, but neither do they immediately euth based on a short "evaluation". Yes, it takes more than 10 minutes to know people. You could know a person a lifetime and not know everything about them, their fears, their secrets, their hopes and dreams. I cannot honestly believe you'd think you could know a person in 10 minutes. That's rather silly. Lake County News Sun shows us how to mis-report!